Location: Vallon-Pont-d'Arc, in the Ardèche departement of France (Rhone-Alpes Region). Notes: Château de Vallon-Pont-d'Arc is located in the eponymous town in the extreme south of the Ardèche.The first castle of the city was located on the hill called the Chastelas east of the current city. Burned in 1559 at the beginning of the religious wars, it was rebuilt and then destroyed again by the Protestant troops of the Duke of Rohan in 1628. In 1629, after the capitulation of Privas, King Louis XIII frees all Protestant places of Vivarais, which Vallon-Pont-d'Arc and impose a fine of ten thousand pounds to the Protestant inhabitants and the obligation to build a new castle for the lord of the moment, and where he must decide on. 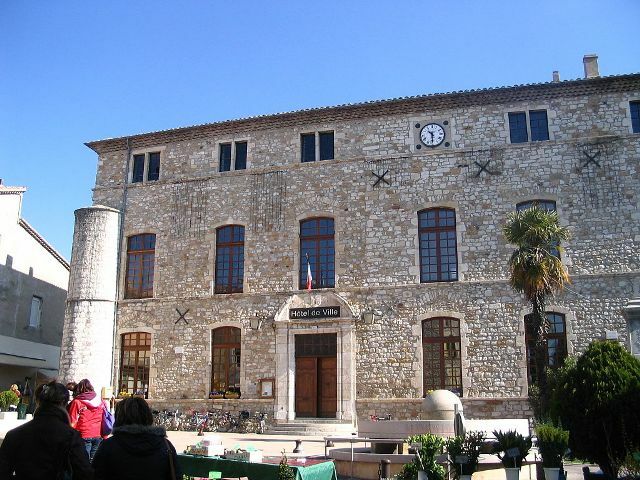 He chose to build in the locality Saint-Saturnin where there was a building in ruins of the late sixteenth century which was the basis for the present castle. Work began in 1630 and ended in 1639. The walls were built of pebbles and stones, in the continuity of the remains of old foundations. In 1748 the Merle family Lagorce buys the house. The municipality acquired the building to Henriette Merle heirs of Lagorce in 1847 for the sum of 42,000 francs, and installed successively schools, peace justice, pastor of housing, telegraph, weighing cocoons ... The castle is today ' hui city Hall and is open to the public.